I have a lot of favorite movies, but this is definitely one of my most favorited of favorites. The first time I watched it, I was not aware that it would be entirely sung, and I had no clue how emotional it was going to be. Because I didn't know what to expect, I wasn't too sure how I felt about it afterward. I watched it again for the second time the other day, and this time knowing what to expect, I was absolutely thrilled with the movie. Had I had less control, I would've cried the entire (almost) three hours. Anne Hathaway surprised me with her chilling and heartbreaking solo. 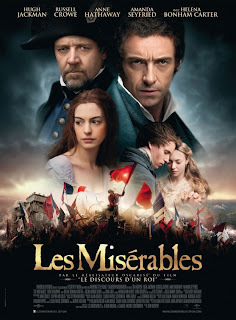 Hugh Jackman astounded me with his beautiful and may I say perfect portrayal of Jean Valjean. Russell Crowe was stiff and stoic, but that's who his character is. Eddie Redmayne's voice is a dream. This movie is not for the faint of heart, but if you want to really feel raw human emotion—everything from unrequited love to complete desperation, to loss, victory, honor, guilt, and selflessness, this movie will do it for you. I'm kind of obsessed. Dare I say that this movie is perfectly cast, perfectly directed, and perfectly executed? I dare. Yeah. Read it. Borrow my copy. I'm a Texan, born and raised. I love a good debate, a well-written article, listening and reading, making and eating cookies, important films, sun & water, flowers of every kind, learning new skills, sports, great music, genuine people, and appreciating the goodness in the world around me.